This is how you work out the value of the dotted eighth note. If your answer was correct, congratulations - you understand how to use dotted notes. If you made a mistake click here to go back to the page explaining how to calculate the value of a dotted note, or close this window if it opened over the question on the previous page. Remember: The dot takes half the value of the note. 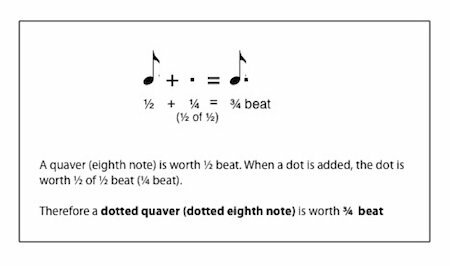 In the case of the dotted quaver (eighth note) this means the dot takes a quarter of a beat. 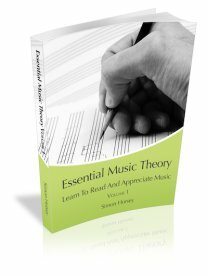 Adding this to the original value of the note (half a beat) we get three quarters of a beat.